Last summer we had one of our mobile LED screens at the Minnesota Twins booth at the Minnesota State Fair for twelve days. They build a miniature baseball stadium where children would play wiffle ball, and we placed our Jumbotron unit behind the outfield wall to make it feel like an actual stadium. 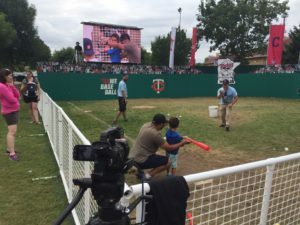 It was a great way for the kids to have a fun experience and connect with the Twins organization, and the LED video wall really helped bring that all together. This past year, the screen was used to display promo material and sizzle reals for the Twins, as well as daily schedules of events at the fair, and then we also streamed the Twins’ games live on the days that they played. While this a great feature to the booth, we know there are other ways to create an even more interactive experience for the guests. In addition to the above uses for the screen, we also brought our cameras for one day just to test how the fans would react. When the kids would go up to bat, we put them on the big screen live so they could see themselves using our camera crew. The kids loved seeing themselves at bat on the mini Target Field, and parents loved it as well! It’s a great photo/video opportunity to get their children playing wiffle ball in the stadium with the Twins, and even better to get them playing ball on the Jumbotron. We felt the experience could be even better improved by adding baseball background sounds like you would hear at the ballpark. We also thought it would be fun to get a soundboard of the announcers saying some common phrases that could be played at the press of a button, for example, when someone hits a home run, we would have several sound bites ready to fit the situation. The LED video wall is a great way to add to an already exciting event, but even beyond that there are other ways to grow from that. 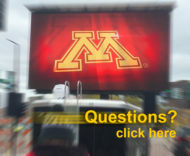 Fire Up Video provides mobile LED screens for outdoor events across the Midwest, including states such as Minnesota, Wisconsin, Iowa, Missouri, Kansas, Nebraska, Colorado, North Dakota, South Dakota, Michigan, Illinois, Indiana, Ohio, Tennessee, Kentucky, and more. For more information, please contact us at baum3@earthlink.net or 844-533-8848.